Set out to find lost heroes, creatures, and cities as you build your kingdom in this first expansion to Eight-Minute Empire: Legends! Faster gameplay! Players now select cards simultaneously from separate hands. 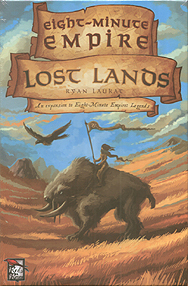 Eight-Minute Empire: Lost Lands is an expansion and requires Eight-Minute Empire: Legends to play.